English professor Karis Shearer jumped on the opportunity to work in a faculty whose structure reflects what she is actively researching—the relationship between creativity and criticality, via poetry in Canada. Today, she’s making past knowledge available again in the present, providing ways to study aural forms of Canadian poetry, and helping build new pedagogies in literary studies. DISCOVERING LONG LOST INTERVIEWS with poets or listening to Warren Tallman’s retirement speech from UBC, which he practiced and recorded on tape while sitting in his living room, is the kind of research that gets Karis Shearer excited. Shearer, an English professor and Director of the Humanities Data Lab at UBC’s Okanagan campus, loves “the surprise” of the archives, and how they can reframe our contemporary practice. Immersed in the Vancouver poetry scene of the ’60s and ’70s, as well as mid-century teaching of creative writing, Shearer has come to realize that sound recordings and the performed poetry reading have both been neglected in criticism. Professor Karis Shearer rescues and archives decades-old recordings of poets, such as this one from May 1966 by CBC of Robert Duncan, titled “A Portrait of a Poet.” It was captured on a seven-inch reel of Scotch acetate recording tape. In essence, Shearer suggests: If you can’t access the recording how can you engage with it? There are so many conversations about poetry and poetics that have been recorded, she says. Right from the time portable tape recorders were invented, writers used the tape recorder as a legitimate way of composing not just poetry but also other literary audio genres: interviews, poetry lectures, and notes toward writing a critical book or essay, for example. In some cases, there was no print version, just the tape. Over the past four years, Shearer has been delving into documents archived on tape—including Warren Tallman recordings on loan from her colleague, Professor Jodey Castricano—and has found they hold powerful contributions to the literary field. 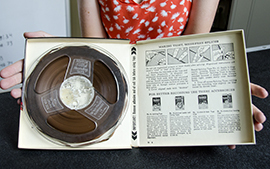 When the reel-to-reel recorder became available to the general public in the mid-1950s, there was suddenly a portable technology that made it possible to create and share one’s music, poetry, oral histories, interviews, and other literary audio genres like never before—as we do now with our smart phones. This technology was received with excitement by the poetry community. Karis Shearer is an avid triathlete. At the same time, poetry readings—like those by Order of Canada recipient Daphne Marlatt, by parliamentary poet laureate Fred Wah, and by teacher-painter-photographer-poet Roy Kiyooka—were also popular, and were recorded and shared across the community. Other literary audio genres such as the poetry lecture, the informal interview, the group poetics conversation can all be found in the collections housed in Shearer’s “Poetry Okanagan Sound Archive” project. 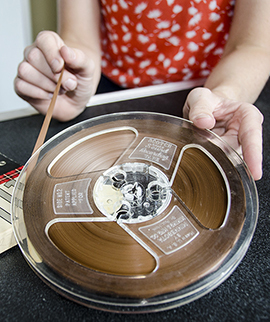 “We are at a point where that historical media is starting to disintegrate; we are at a point where we may lose access to this historical audio if we don’t digitize it,” Shearer says. The digitization of archival recordings allows a whole range of new critical documents to join the conversation around Canadian poetry: researchers will be able to engage with the audio as well as with transcripts that can be read and searched. With the help of one of her UBC colleagues, Professor Stephen Foster, Shearer was able to get her hands on an old Sony reel-to-reel player. She began digitizing and editing the tracks prior to launching the Poetry Okanagan Sound Archive project in 2012, with the help of then-UBCO undergraduate student Lee Hannigan. (Hannigan has since gone on to doctoral work on reel-to-reel technology at the University of Alberta.) In subsequent years, Shearer and professor Dean Irvine from Dalhousie University co-directed Editing Modernism in Canada summer institutes on editorial theory, which focused on print, digital and audio texts. In 2015, Shearer collaborated with her colleague, professor Constance Crompton, to launch UBC’s Humanities Data Lab, which has housed the Poetry Okanagan Sound Archive since its opening. The first Creative Writing degree program in Canada did not start until 1965 at UBC Vancouver. Creative writers, such as UBC’s Earle Birney, Sheila Watson (University of Alberta) and Louis Dudek (McGill), did work in universities, but they were hired into English departments in the ’50s and early ’60s mainly to teach the study of literature—be it medieval, early modern or modernist. Shearer’s book will be about masculinity, pedagogy and power, as well as looking at how the professors’ writing practice informed their teaching. Arriving from Concordia University in Montreal, Shearer was intrigued by UBCO’s Faculty of Creative and Critical Studies because her research focuses on just that: creativity and criticality. “The opportunity to work in a faculty that was structured around the two components I was actively researching was extremely compelling, as was the potential for collaborating with my creative colleagues,” she says. Plus, the Okanagan climate and possibility of re-engaging with the outdoors—being out in a region that was both urban on a small scale and had active outdoor pursuits—also enticed Shearer. 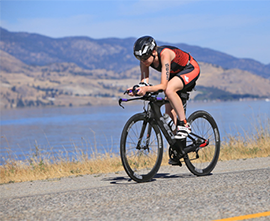 Now, Shearer does Ironman triathlons and recently represented Canada as an age-group athlete at the ITU Long-distance World Championships in Penticton, 2017. And in her spare time she helps direct a women’s cycling club in Kelowna. “Dr. Shearer has been a huge support,” says Cole Mash, a master’s student in English and Creative Writing. “She has given me many opportunities and only asked that I work hard. She changed how I looked at literature and showed me there is an exciting career to be had talking about books.